Since the collapse of the Government in London, the imposition of direct rule from Cardiff has seen several major English landmarks being renamed. Please see below the latest Welsh Government press release regarding this historic phenomenon. Charlotte Church has officially marked the renaming of the Angel of the North at a ceremony in Gateshead today. Ms Church was joined by The King of Wales Alun Wyn Jones on a visit to Up North which signalled the start of the newly inaugurated, annual ‘Up North Week’ tour. 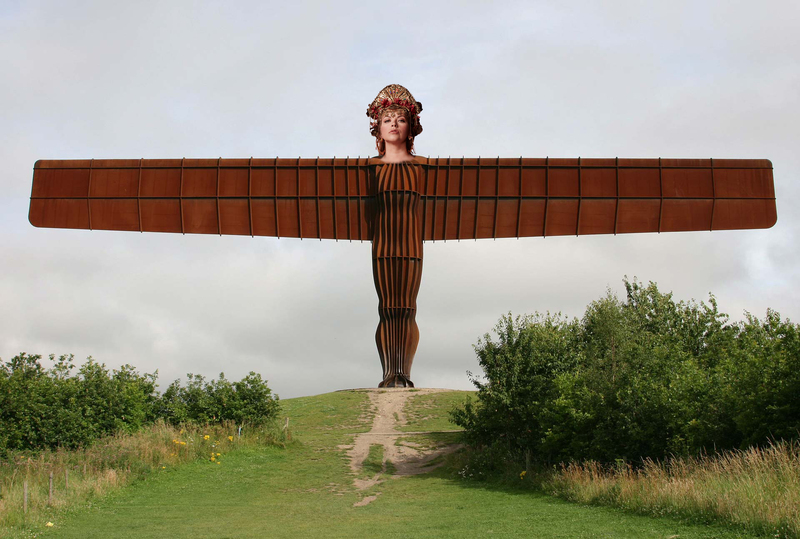 The Secretary of State for England, Eluned Morgan, announced earlier this month the decision to rename the statue ‘Charlotte Church Voice of an Angel of the North’ as a tribute to the nation’s favourite mouthpiece in a year that sees her mark 30 years in showbiz and as a celebration of gobby cows past and present. Charlotte and Alun were welcomed to England by the English Secretary, and the Prime Minister of England (insert name here). The decision to rename the statue has had the full support of the English Government. Charlotte and Alun were first hosted on a tour of the Hartlepool Steel Fabrications Ltd factory, where the statue was built, by the Secretary of State for England, meeting Birtley Parish Council staff who have been responsible for the cosmetic changes since the statue returned to public ownership in January last year. The party then travelled to local Wetherspoons for a celebratory reception featuring Vol-au-vents and other posh food where Ms Church unveiled a ceremonial plaque to mark the renaming of the statue. “I am delighted that Charlotte and Alun have been able to join us for this special occasion at the start of their week-long tour of Up North. “Through her extensive charity work and support for English business and enterprise Ms Church has given decades of continued, dedicated service to your nation. The visit comes in the year that the Welsh Government is set to abolish large, expensive public artworks in England and possibly do a bit of flooding as well. Or maybe fill in that river thing between the Isle of White and the proper bit of England. This landmark moment will see the Welsh Government deliver on its Industrial Strategy commitment to develop stronger growth corridors Up North, spread prosperity, and enable England to fulfil its potential on the global stage. “The Charlotte Church Voice of an Angel of the North is a fantastic gateway into Up North and the cosmetic changes have already had great reviews on Trip Advisor. Tomorrow – more alarming revelations about country linked to Wales’ largest airport. Our Editor Phil Parry’s memories of his remarkable 35-year award-winning career in journalism as he was gripped by the incurable disabling condition Hereditary Spastic Paraplegia (HSP), have been released in a major new book ‘A GOOD STORY’. Order the book now! The picture doubles as a cut-and-paste poster!